Kang Sok Ju has replaced Kim Yong Il as WPK Secretary for International Affairs and has probably replaced Kim as Director of the WPK International Affairs Department [IAD]. 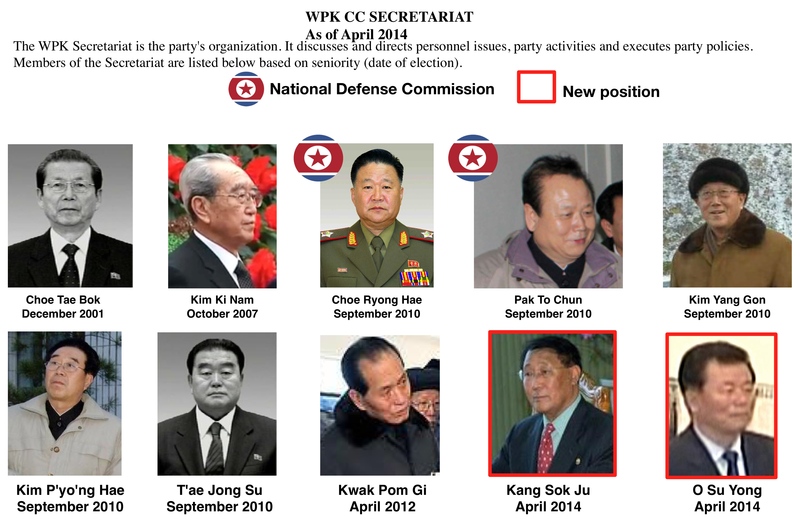 One of late leader Kim Jong Il’s closest foreign policy advisors and aides, Kang Sok Ju served as DPRK Vice Premier from 2010 to 2014. Prior to that Kang served as 1st Vice Minister of Foreign Affairs, where he was the DPRK’s top foriegn policymaker. Kang’s migration from the DPRK Government (as Vice Premier and 1st Vice Minister) follows a similar path to that of Kim Yong Il. Kim was appointed to the IAD in 2010, after having served as a Vice Minister of Foreign Affairs (under Kang Sok Ju, no less). O Su Yong has been appointed WPK Secretary for Light Industry. A technocrat, O was the party’s regional boss as Chief Secretary of the North Hamgyo’ng WPK Committee from 2010 to 2014. In that capacity, he was part of Kim Jong Il’s travel party during visits to China in 2010 and 2011. From 2009 to 2010 O was a Vice Premier and from 1999 to 2009 served as Minister of Electronic Industry. Choe Ryong Hae, following his removal from office as Director of the KPA General Political Department on April 26, is believed to be serving as WPK Secretary for Workers’ Organizations. His current position in the WPK Secretariat is based on his appearance and delivery of a speech at a ceremony opening a renovated children’s camp in Wo’nsan, a ceremonial duty germane to the head of the Workers’ Organizations’ apparatus. Choe is probably concurrent Director of the WPK Workers’ Organization Department. With his new positions Choe has replaced two officials tied to the late Jang Song Taek. On the WPK Secretariat Choe has replaced Mun Kyong Dok, who served as Chief Secretary of the WPK Pyongyang City Committee from 2010 to 2014. After the 3rd Party Conference, a slot on the WPK Secretariat was designated for Pyongyang’s party boss and a protege of Jang’s. As the Director of the WPK Workers‘ Organizations‘ Department, Choe has replaced Ri Yong Su, who has been appointed as a university rector. Hwang Pyong So, given his appointment as Director of the KPA General Political Department, is now ex aequo WPK Secretary for Military Affairs. However, it remains to be seen if VMar Hwang will have a formal listing as a member of the WPK Secretariat. An Jong Su has been appointed Director of the WPK Light Industry Department. An was appointed Minister of Light Industry in June 2010 during the 3rd session of the 12th SPA. The Ministry of Light Industry was consolidated into the Ministry of Food and Consumer Goods during the opening session of the 13th SPA, held last month. An replaces Paek Kye Ryong, who had been appointed department director in April 2013. 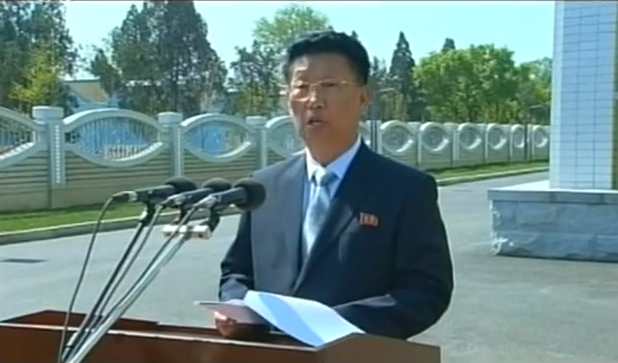 Kim Su Gil, Chief Secretary of the Pyongyang WPK City Committee, speaks during a ceremony on May 2, 2014 opening workers’ dormitories at Kim Cho’ng-suk Textile Mill (Photo: KCTV). Lt. Gen. Kim Su Gil has been appointed Chief Secretary of the Pyongyang WPK City Committee. One of Kim Jong Un’s close military aides, Lt. Gen. Kim appeared at a May 2 ceremony opening a workers’ dormitory and identified in DPRK state media as the party’s boss in the DPRK’s capital city. Pyongyang was Jang Song Taek’s turf for a number of years (one of Jang’s first major jobs was in the party apparatus in Pyongyang city government) and Lt. Gen. Kim’s appointment is intended to reinforce KJU’s authority and vanquish whatever remains of Jang’s influence. Kim Kyong Hui in 2012 (L) and in 1980 (Photo: KCNA and KCTV). Buildings at Kim Kyong Hui’s main residence in central Pyongyang that include her office, technical and domestic staff and dining facilities (Photo: NK Leadership Watch). Far from Pyongyang and away from the DPRK’s political culture, these changes to the top party leadership are being observed and probably aided by Kim Kyong Hui, KJU’s aunt and Jang Song Taek’s widow. Although Madame Kim currently resides abroad in semi-retirement and is likely no longer an active part of the central party, she has close political and/or personal ties to many members of the WPK Secretariat. In addition to her longstanding personal ties to the Secretariat’s senior members Kim Ki Nam and Choe T’ae Bok, she is equally close to Kang Sok Ju, the new WPK Secretary and Director of the International Affairs Department. Kim Kyong Hui was the IAD’s former senior (1st vice) deputy director from the mid-1970s to the early 1980s. Kang served as a cadre and section chief under Madame Kim in the 1970s and she was instrumental in his appointment to the DPRK’s foreign service and his first major diplomatic posting to the DPRK’s UNESCO Mission. The WPK Light Industry Department was Kim Kyong Hui’s fiefdom for nearly three decades. An Jong Su, the department’s new director, served as Minister of Light Industry in the government whilst Madame Kim directed policy from the central party. An’s migration from the DPRK Cabinet to the party might be due in part to saving the career of one of Kim Kyong Hui’s former subordinates in the aftermath of an institutional consolidation. Finally, Kim Kyong Hui has been vouching for Choe Ryong Hae since they were children. Put aside the sheer nonsense about Choe’s health costing him his job at the KPA General Political Department, there is an even chance Madame Kim intervened with KJU to have him absolve Choe whatever trespass of greed, envy or pride the new WPK Secretary of Workers’ Organization committed during his tenure at GPD. This entry was posted on 05/06/2014 by nkleadershipwatch in Uncategorized.